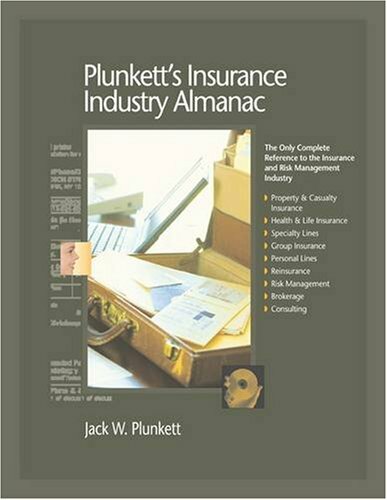 Publisher: Plunkett Research Ltd, U.S.A.
Insurance and risk management make up an immense, complex global industry, one which is constantly changing. Competition continues to heat up, as mergers and acquisitions create financial services mega-firms. As the insurance industry grows more global, underwriters see huge potential in China, the world's fastest-growing business market. Meanwhile, technology is making back-office tasks easier and more efficient, while direct selling and e-commerce are changing the shape of the insurance industry. This carefully-researched book (which includes a database of leading companies on CD-ROM) is a complete insurance market research and business intelligence tool-- everything you need to know about the business of insurance and risk management. The book includes our analysis of insurance and risk management industry trends, dozens of statistical tables, an industry glossary, a database of industry associations and professional organizations, and our in-depth profiles of more than 300 of the world's leading insurance companies, both in the U.S. and abroad. Jack W. Plunkett is CEO &amp; Publisher of Plunkett Research, Ltd., a Houston-based provider of market research and industry information in printed and electronic formats. Plunkett's client list includes 5,000 leading corporations, universities and government agencies worldwide. Plunkett's research products are distributed electronically through subscriptions to its website and around the globe by major booksellers and news distributors. Jack Plunkett's work has been widely covered by hundreds of magazines, newspapers and broadcast stations, including stories in USA Today and Inc. Magazine. Plunkett is frequently interviewed as an expert source by publications such as Newsweek, The Wall Street Journal. The New York Times and Investor's Business Daily, media outlets such as NPR's Marketplace, ABC, and CBS Marketwatch, as well as local and regional newspapers and national columnists. AbellaBooks.com, listed on Abebooks Discount Prices, Unbeatable Service¿ Abella Books provides a array of textbooks spanning the latest children¿s books, Juvenile Literature, Adult Novels, PRE-K Textbooks, K-12 Textbooks, College Textbooks, Professional Textbooks, Legal Textbooks and Medical Textbooks. Our goal is to provide a superior online buying experience growing our business through positive word of mouth and returning customers. With unbeatable customer service and unheard of prices make Abella Books your one-stop-shopping book buying source for all your textbook and leisure reading needs. Books with one-time use access codes and those with used and/or open access cards are not returnable if unsealed and/or used. All "One-Time" use Printed Access Code Cards or "One-Time use Book Software must be returned in factory sealed condition to be eligable for a return. AbellaBooks.com Abella Books listed on abe books Orders usually ship within 2 business days. Shipping costs are based on books weighing 2.2 LB, or 1 KG. If your book order is heavy or oversized, we may contact you to let you know extra shipping is required.